I find it hard to find songs for Ascension day - don't you think the disciples must have felt a bit lost, especially in the Acts narration? Taizé / CP194 / URW392 Stay with us / Bleib mit deiner Gnade / Night will soon fall (Jacques Berthier) Another good one from Taize. We sang this a while back at BUC, it would be good to do it again. Sheet music and sound samples. *Online Resource O Christ when you ascended (Carolyn Winfrey-Gillette) Excellent down-to-earth words to a sort of familiar hymn tune (LANCASHIRE). Highly recommended. Lyrics. I would probably sing it to ELLACOMBE. New words to old tunes. *TiS 185 Alleluia We praise you God Creator Lord (John Charles McIntyre) A chanted Alleluia based on Pachelbel's canon, coupled with some nice affirmations of faith from a 2nd part of the congregation, or cantor. This is quite lovely. Taizé / TiS 730 / AoV1-152 / ATOK 387 / CH775 / UMH488 / WoV740 / ELW616 / GA308 / A&M838 / HPP214 / GtG227 / PH599 / G(II)293 / GC404 / GC(II)422 / G(3)510 / W&R285 / Cha569 / Srce387 / URW382 / Lau253 / StF777 Jesus remember me (Jacques Berthier) A beautiful chant, but we have not sung it often. Sheet music and sound samples. *VU359 / AA059 / W&R454 / STB205 / Online Resource He came singing love (Colin Gibson) A lovely image and reasonably straightforward song. Might need to be taught. Sheet music. *TiS 541 / CH674 / WoV722 / ELW535 / GtG538 / G(II)394 / GC562 / GC(II)529 / G(3)626 / CP082 / SP&P190 / W&R709 / ZSS198 / URW400 Hallelujah we sing your praises / Haleluyah! Pelo Tsa Rona (South African) Joyous and simple song. Sound sample. Sheet music sample. Good for kids. NCH271 / UMH538 / VU196 / PH131 / CP249 / W&R333 Wind who makes all winds that blow (Thomas Troeger) Excellent words. Familiar tune (ABERYSTWYTH). Lyrics and sheet music sample. New words to old tunes. TiS 387 / CH416 / UMH318 / VU158 / LBW363 / ELW389 / A&M199 / GtG246 / PH108 / CP(E) 140 / W&R312 / 82Hml-182 / Lau272 / StF297 Christ is alive Let Christians sing (Brian Wren) Excellent words of Christ's saving, and still relevant grace. A couple of tunes are offered in different hymn books. I prefer TRURO. Lyrics and sheet music New words to old tunes. TiS 419 / NCH270 / CH592 / A&M252 / UMH544 / VU205 / WoV685 / ELW403 / HPP222 / GtG285 / PH314 / CP635 / CP(E) 185 / W&R327 / SP92 / 82Hml-513 / StF389 Like the murmur of the dove's song (Carl P Daw) Excellent words and a simple tune about Christian unity. Each verse ends with "Come holy spirit, come". Lyrics and sheet music. NCH259 / LBW157 / ELW393 / PH141 / GtG258 / GC454 / GC(II)467 / G(3)545 / W&R322 / 82Hml-217 A Hymn of Glory Let Us Sing (The Venerable Bede) Not all hymnals are inclusive or accessible. For example, they probably don't have the word "thitherward" like these lyrics. Thank goodness. It's quite formal, sung to a good hymn tune and with lots of Alleluias. It's good to sing hymns written before the year 1000 sometimes, don't you think? Lyrics. Oldy-but-a-goody. TiS 398 / AHB 310 / AoV1-118 / NCH289 / CH489 / UMH475 / VU367 / GA375 / A&M238 / LBW508 / ELW804 / GtG282 / PH313 / GC465 / GC(II)471 / G(3)556 / RS617 / CP645 / CP(E) 175 / W&R330 / Cha582 / Srce100 / Lau303 / StF372 / MP089 Come down O Love divine (William Williams) Old fashioned, but still inclusive and very well known. Words and tune. 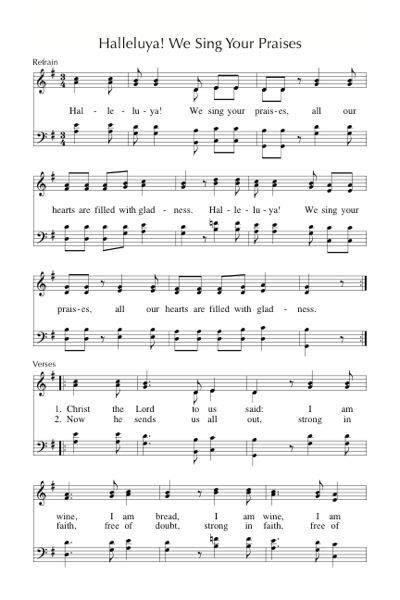 Hymnals vary a lot in the lyrics with respect to thees and thys and words like "vesture". Oldy-but-a-goody. WoV743 / SFFS 2199 / SP&P093 / URW115 Stay with Us (Herbert Brokering) Simple song of comfort. This is a slightly mournful song, that could pick up on the loss that the disciples may have felt when Jesus ascended. I like the tune STAY WITH US best (WoV, URW, SP&P). Lyrics (downloads a pdf). What about Thuma Mina? Picks up the filling and sending themes in the text, and also great for kids. A really useful site - thanks! - always visit when I'm stuck.